Jacque Harold MacKinnon was born November 10, 1938 in Dover. His father, Harold, was a shortstop in the Yankees farm system who continued to play semipro ball when Jacque was a child. Jacque (pronounced Jack) was a big, fast and superbly coordinated athlete who blew through tacklers in youth football. Jacque was a running back and linebacker for the Dover High School Tigers and continued his football career at Colgate University after graduating in 1957. There he earned a reputation for sure hands and devastating blocks. He was also the nation’s top punt returner as a junior in 1959 with 17.5 yards per return. As he had at Dover, Jacque also was a member of the Colgate track team. Jacque was drafted by the Eagles with the last pick in the 1961 NFL Draft, but chose instead to play for the San Diego Chargers of the year-old American Football League. The Chargers used Jacque primarily as a blocker and on special teams as they made it all the way to the AFL championship game. San Diego lost to the Houston Oilers, 10–3. 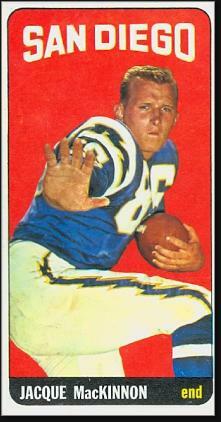 The Chargers returned to the title game in 1963 and beat the Boston Patriots. Jacque played both tight end and running back for the Chargers, and occasionally filled in a play or two on the offensive line. He had a 100-yard rushing game in 1962 against the Bills. Coach Sid Gillman often used him in a two tight end set with Dave Kocourek. In 1966 Jacque caught 26 passes and scored 6 times to earn AFL All-Star honors. In 1968, he caught 33 balls for a career-high 646 yards, 6 TDs and was an All-Star again. He thus earned the distinction of being the only rock-bottom NFL draftee to become a two-time All-Star. That year in Week 4 he torched the Broncos for 172 yards and a pair of touchdowns in their first meeting. Three weeks later, at Buffalo, he caught 3 passes for 103 yards and a pair of touchdowns. Of Jacque’s 20 career touchdown catches, 16 were delivered by John Hadl. In 1970, after eight years in San Diego, Jacque played four games for the Oakland Raiders. He gave pro ball one more try in 1974 when he joined the Southern California Sun of the World Football League. He caught one pass for 37 yards in his lone WFL appearance. That winter, in March, Jacque was involved in a drunk driving accident in San Diego. Fearful of the consequences, he fled the scene and hopped over a wall, not realizing it belonged to an active construction site. He plummeted 30 feet and suffered a fatal head injury at the age of 36. The Chargers included Jacque in their Ring of Honor in 1976. In 2003, Jacque’s high school retired his number 58.